Think back to the last time your friend told you about an amazing book or movie. Now, raise your hand if you can actually remember the title of that book or movie. We agree that there are just too many things to keep track of, but our pretty awesome Catalog is here to help. 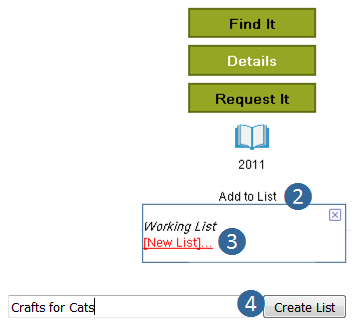 You can create a saved list to keep track of items you want to check out later. Or movies your whole family agrees on. Or cookbooks you want to refer to later. Find a title you want to add to your list, and click to Add to List. Name it and click Create List. For more about saved lists, check out this two-minute video! This is the first of eight weekly tips about our online library catalog.